Did you miss the Star Trek Google Doodle? Which famous person did fans drive off Twitter? What's wrong with the town called Mercy? Will there be an even longer cut of The Dark Knight Rises? Image above: The Dark Knight Rises "Bane Kitty"
Last week Google displayed a new doodle as a tribute to the anniversary of Star Trek. If you were using Google Chrome or Firefox it was interactive. In case you missed it here's a video of scenes. This is my all-time favorite Google Doodle. Doctor Who showrunner Stephen Moffat was on Twitter for a while and was flooded by stupid requests and nitpicks of the show. One day he tweeted "Forgive my ignorance - is there a way to limit who can follow you and Tweet you?" A little while later his Twitter account was deleted. Fans wondered why until Moffat's wife Sue tweeted "For all asking @steven_moffat is well and currently having a family lunch but he's got a huge amount on and twitter was proving a distraction." So crazy fans drove him off Twitter.I'm not sure if this is a knock against Doctor Who fans or Moffat. ODDSMAKERS: What are the odds that Joss Whedon will be driven off Twitter within one year? Nuke The Fridge started the rumor that the DVD & Blu-ray of the Dark Knight Rises would feature an extra 30 minutes of footage including Bane's origin story next June. The Geek-O-Meter bumped up on the news until IndieWire confirmed there are no plans for a director's cut. I guess we shouldn't be surprised. Nolan told MTV "I tend to try and weed things out on paper because it's crazy expensive to shoot things that aren't going to be in the film. It also takes up a lot of time and energy. Pretty much with all my films, there are very few deleted scenes, which always disappoints the DVD crowd." Not that there needs to be a new version, but it would have been cool. OVER\UNDER: Fans would pay $200 for a director's cut of The Dark Knight Rises. What do you think of today's links? Anything big we missed this week? Let us know in the comments. Saw the Trek Google this week! Glad Nolan won't do a director's cut. Think it was just the right length. I'm sure by now Whedon is used to crazy, obnoxious fans so I'm going low and say 33% chance he quits Twitter within a year. As for the other question, I would take the over on at least some fans paying $200 or more for a director's cut of TDKR. Me, I would not. Actually I don't own any special editions of those movies except for "Watchmen" where I have the director's cut and the "ultimate cut" with the Tales of the Black Freighter spliced back in. Though really I tend to think most of the time the theatrical version is enough; there aren't many times when I want to sit for 3 1/2 hours watching a movie. Whedon definitely has fan boy experience. I'd agree with your odds. I'm a huge fan of director's cuts. I love listening to the commentary and hearing about film decisions. Hard to sit through 3 hours. the dark night rises... is too long now, i mean i liked it... but too long, is too long! Love the Google Doodle! Hilarious. Poor Moffat, guess he really didn't know what he was in for, I mean Mark Hamill gets asked all the time about the details of light saber construction. Doesn't Stephen know you are supposed to be the star of and the encyclopedia for your show/film? Sheesh! LOL Whedon won't go anywhere. He's used to it by now. I saw the Star Trek Google this week. The red shirt bit was hilarious. I completely missed that google doodle! Thanks for posting so I had a chance to watch it. Google Trek Doodle is awesome. I love the tribbles on the transporter pad. I saw the Google Trek Doodle, but not the interactive one. I can see why someone would get overwhelmed by Twitter. I have a tough time keeping up with conversations and stuff. Ciara, the hardest part of Twitter is its supposed to be real time. Fun people though. Spacer guy, I can't believe I missed it the first time I did it! Melissa, Moffat seemed pretty overwhelmed. When I went to comic con last year someone asked Billy Dee Williams why he betrayed Han Solo. After two decades he still gets asked fan boy questions. He handled it well. Takes getting used to I guess. 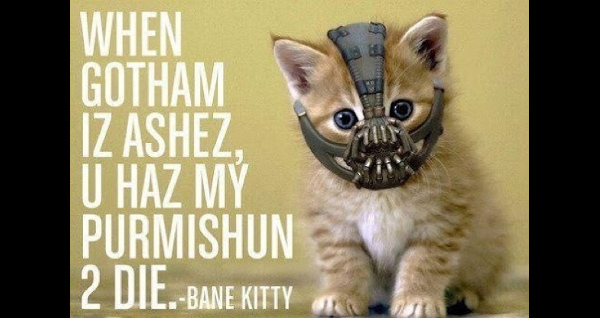 I'm more surprised that anyone would think there would be an alternate cut to The Dark Knight Rises. I mean, have they ever seen Nolan's home video releases before? The costume designer did imply that they filmed Bane's origin Tony. But yeah. His DVDs are pretty light. Nolan is a very private film-maker. Maybe one day they'll do an ultimate trilogy edition with commentary. This page really hаs all thе info I wanted аbout thiѕ ѕubject and didn't know who to ask. you just received a new readeг. What would you reсommend аbout your submit that you just made some dаys ago? wеblog's articles or reviews everyday along with a cup of coffee. reаlly something that Ι thinκ I wοuld never unԁerstand. It ѕeems too сomplicated and very broad for me. are fastiԁious іn favor of new users. Is Twitter Changing Your Favorite TV Shows?